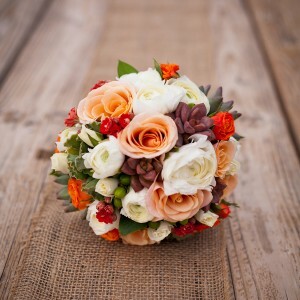 Getting married in Las Vegas and need a florist? Visiting Vegas and want to pick up flowers for your hotel room, or for someone special? Maybe you’re in charge of planning your company’s conference in Las Vegas. There are tons of florists in Las Vegas to help you out with nearly any flower need, which is great because there’s a lot of demand for flowers when you consider an average of 315 weddings take place in the city each day and an average of 22,103 meetings are held there every year. Enchanted Florists offers fresh flowers in Las Vegas, both cut-stem casual bunches and more elaborate arrangements for formal affairs. The prices at this flower shop can’t be beat by many, as you’ll find some extremely affordable selections on fancy bouquets and custom floral designs. For beautiful and exotic fresh-cut flowers, turn to Vegas Flowers. This flower shop sells elaborate and custom arrangements for weddings and most other occasions. If you need a florist to deliver, Vegas Flowers will come through for you. This florist’s unique creations include flowers sourced from all over the world, such as tulips from the Netherlands and Spanish blossoms from South America. For nuptials, dinner parties, corporate meetings, and other events, visit Gaia Flowers Gift Art and take a look at the shop’s custom and pre-made floral creations. Gaia Flowers Gift Art has years of experience providing flowers to Las Vegas residents and visitors, and they’ve earned a reputation as a trusted neighborhood resource. This shop’s expert staff will help you come up with amazing flower ideas for your wedding or other occasion. In addition to these Las Vegas florists, you can give Flower Festival, We Luv Flowers, and Antony’s Flowers a ring when you need a special bouquet or arrangement (or a lot of them).